Located in the peaceful residential village of Exo Gonia, Cavern House Helios is ideally located for exploring Santorini with the beaches of Kamari and the island’s capital Fira both within just 15 minutes’ drive. The award-winning taverna Metaximas is just a minutes walk from the door and the neighbouring village of Pyrgos offers an assortment of shops and amenities. Carved from volcanic rock, this traditional Santorinian home comprises 3 double bedrooms, 2 bathrooms, kitchen, lounge, a courtyard with dining areas and sun terrace with spa pool. Cavern house helios offers panoramic views of the vine terraces of Profitis Ilias and across the Aegean to the island of Anafi, whilst the courtyard provides shaded space for dining and entertaining. Restored in the traditional style of the island to an excellent standard and boasting modern facilities and features, Helios is fully equipped with a washing machine, all kitchen appliances, cutlery and crockery, a barbecue, a flat screen TV and DVD player with a broad selection of films. This stunning property is best enjoyed from April through to November, with seasonal offers available during the quieter months. The view is just what you see in the pictures, the house was more than we expected. But most of all, the Hospitality that Panos showed us, was above and beyond. He was there and took care of every need. I would recommend staying here to everyone. A week in Cavern House Helios was the highlight of our month long trip around Europe. The house was spacious with everything you could possibly want located in a quiet part of Santorini yet within close proximity to everything. Sarah was an exceptional communicator and replied promptly to all enquiries and made sure that our transfers and car hire were organised before hand. And Panos, the property manager, was an absolute legend! Not only did he deliver a fresh loaf of bread every morning, he was on hand to help organise massages,kayaking trips and a sunset cruise around Santorini. Nothing was too much trouble for him. He made our stay so much more enjoyable and really went out of his way to ensure that all our needs were met. If you are going to stay somewhere in Santorini, stay here.!! A place with unbelievable views and glorious sunrises, a perfect plunge pool and a wonderful restaurant within an easy walk. A memorable week which scores a 10 out of 10 for us. Owner Sarah and property manager Panos were impeccable. Sarah was terrific about communicating in the months leading up to our stay and thinking of everything we would need. When we arrived, the kitchen was stocked with water, wine, beer, fruit, and other provisions. During our stay Panos was omnipresent in the best sense of the word - nearby when we needed him but not hovering - and brought fresh bread every morning, recommended restaurants and activities, and helped to make reservations. The bottle of champagne on my wife's birthday was a thoughtful touch. We enjoyed the house's quiet location on the east side of the island, away from the tourist crush of Fira, and we greatly appreciated having two good restaurants - Metaxy Mas and Anemoloos - within a short walk. Although Metaxy Mas seems to be the more popular of the two, we felt that Anemoloos outperformed it, both in the quality of the food and the warmth of the reception, and we recommend it highly. Unfortunately, there are no other shops of any kind within walking distance, so plan on a rental car or regular taxi rides. The house was very tastefully decorated and slept our family of 4 comfortably. Although it nominally sleeps 6, it would be tight for 6 adults and possibly even for a larger family. Also, while the cave house concept was a novelty, we would choose an above-ground house in the future for several reasons. First, although the house is more than adequately lit (artificially), there is no substitute for natural sunlight and a view. Only the living room and one bathroom have windows, which look out onto the terrace but offer no view beyond that. (The pool, which has a fine view that is accurately represented in the photos, is one level above the house.) Second, while each bedroom is air conditioned, it is not possible to run the air conditioners unattended for long periods (such as while away from the house or sleeping), because the condensate does not drain to the outside but rather into containers in the rooms that would overflow. As a consequence, the humidity level in the house remains high. In addition, the living room lacks an air conditioner and became uncomfortably warm during the day. On balance, we would say that the property owner and manager are first-class, but the property itself has some important limitations that made it less than ideal for our tastes. We were so happy with our stay at Helios house. We liked that is was away from town and quiet. The roof top terrace with pool was our favourite spot for reading and watching the sunrise. Panos delivered us fresh bread every morning and made excellent recommendations for dinners out and a sunset boat cruise. We loved every minute of our vacation. Bravo! The place is not in one of the major hotspots, but it’s not very far from all the main attractions, especially with a cheap car rental arranged by the host. The restaurant down the street (Metaxi mas) was the best place we dined at during our stay, we went there twice. As many have mentioned, the property manager Panos was very attentive. The rooms were beautiful and traditional cave style - very unique! The terrace had a small pool and lounge chairs, so that was a bonus. I highly recommend this place. 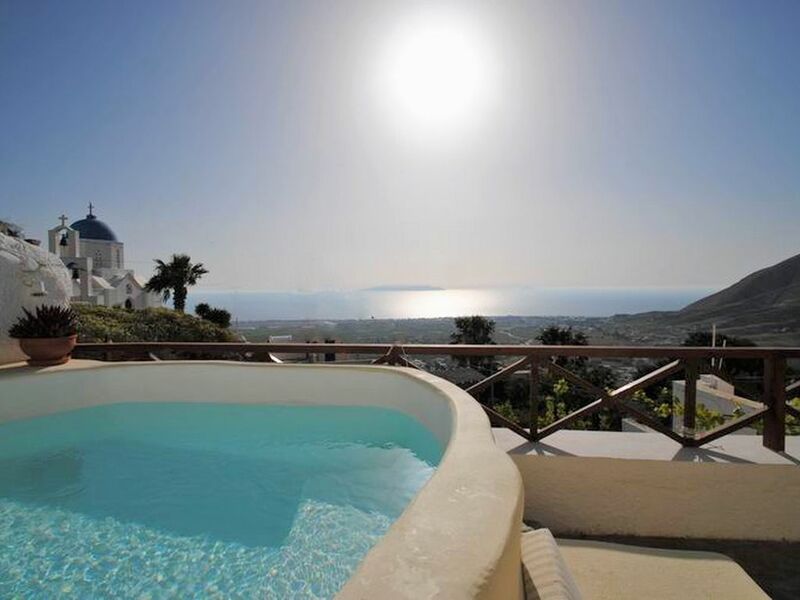 Self catering villa; pool; sea view; quiet traditional cave house.